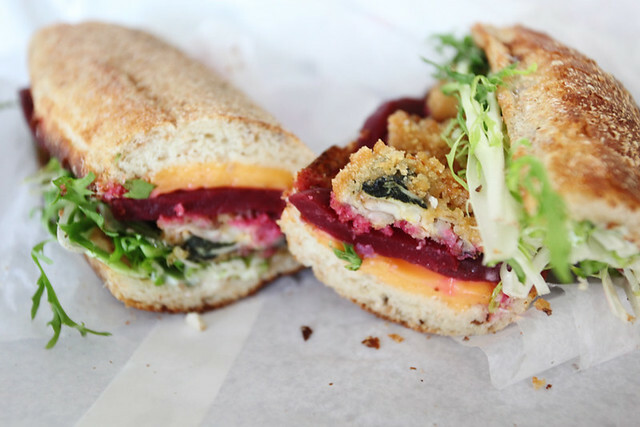 The fried bouchot mussels sandwich from No.7 Sub has, besides fried mussels, pickled beets, frisee and American cheese. When I saw it on the menu board it was hard not to get it. I love fried oysters, fried fish, fried scallops, fried squid but I never had fried mussels before. For a No.7 Sub sandwich this was pretty tame. If you familiar with No.7 Sub you’ll know that they offer couple sandwiches that make you go…HUH? The sandwich looked promising and I was able to get fried mussels in every bite. But the flavors weren’t all there. The pickled beets and mussels were overpowered by the cheese. Once in a while I did taste the beets and they weren’t pickled enough. Though it was nice to get the different textures from each ingredients.